Zultrax is an encrypted file-sharing program. Search for and download your favorite music and video files shared by other users on a free peer-to-peer network equiped with advanced queuing system, multisource swarmed downloads and privacy protection. 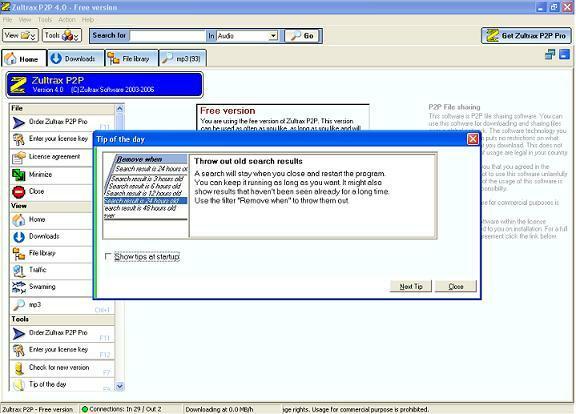 Zultrax is totally free of adware and spyware. Zultrax P2P supports the ZEPP file sharing network. Zultrax P2P comes without a truckload of unneeded features. Search and download files over modern P2P networks, with privacy protection. Zultrax P2P supports the ZEPP file sharing network. On this state of the art network features like encryption, swarming and proxies help to protect your privacy. More about those features ..
Zultrax P2P comes without a truckload of unneeded features. That causes our file sharing program to work fast, fast searches, fast downloads. It should be normal but it isn't for every file sharing program: Zultrax P2P comes free of adware, free of spyware and free of any other unwanted extra. We do also not ask for your E-mail address. Our software is clean. Our file sharing program is easy to use. Zultrax P2P is stable, not over-featured and functional. You can do what you want to do fast and with ease. Everything you need for file sharing is present within the program. All the rest not. Qweas is providing links to Zultrax 3.26 as a courtesy, and makes no representations regarding Zultrax or any other applications or any information related thereto. Any questions, complaints or claims regarding this application Zultrax 3.26 must be directed to the appropriate software vendor. You may click the publisher link of Zultrax on the top of this page to get more details about the vendor.